I've been behind on my TWD baking. I actually made the Granola Grabbers, but they disappeared before I could take pictures of them, and my Tuesday got busy, so I didn't get to blog. Since I had a long weekend, I promised myself I would follow through with this week's recipe. I am so glad I did. These cookies were easy to put together, and made the house smell amazing. They tasted incredible, too. There's something nostalgic in their flavor. I can't put my finger on it. I can't imagine that it is a childhood memory, since my mother didn't bake that often, and certainly would have shuddered at 2 sticks of butter. I don't think they have a Weight Watcher point value for that. There's just a giant red NO when you look it up, I suspect. Still, the taste reminds me of childhood, for some reason. Or maybe it just tastes like what childhood should taste like. I can't help but feel that these are ideal lunchbox cookies--they have protein from the peanut butter, fiber from the oatmeal, and kid appeal from the chocolate chips. Of course, all of this is overlooking the 2 cups of sugar (one brown, one white) and the 2 sticks of butter. It is easy to overlook such things when they taste so good. My story has a sad ending, however. Tonight, Kurt and I went out to run a couple of errands--most important of which was to buy our dog a 40-pound bag of food. Feeling that she had been such a good girl all weekend, I also purchased a nice, meaty knuckle for her to chew on, and some premium kibble that had bigger bites to put in her saucer toy (which she rolls around, eating the bits until it is empty). All of that, and I come home to find a ziplock bag torn to shreds on my rug. I knew immediately that this was no ordinary ziplock bag. In fact, this was the very ziplock bag that held about 10 more of these luscious cookies (one of which I was anxiously awaiting as my dessert). My dog has not gotten her meaty knuckle. She has not gotten her bigger kibble. And she'll be lucky if she gets her regular food in her bowl. Of course, she's probably not hungry, anyway, after eating the last of my cookies. Let's hope the chocolate doesn't affect her, and that I return to speaking terms with her some time this week. 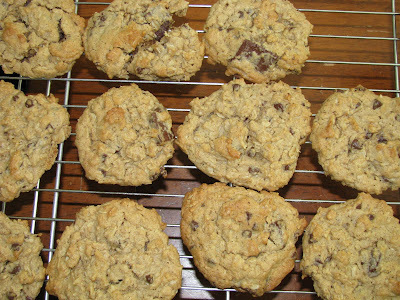 If you would like to check out the recipe, go to Stefany's blog, Proceed with Caution. I would warn you, though, if you do make this recipe, to keep it well outside the reach of your animal companion. Thank you, Stefany, for a wonderful recipe choice! I don't know which made me laugh more--the "giant red NO" or "Of course, she's probably not hungry anyway." =) We had a dog when I was in high school that ate all kinds of things that he shouldn't have, including three-quarters of a box of Girl Scout cookies (peanut butter sandwiches), box, wrappers and all. I hear you on this one! My dog (the one pictured in my blog banner) has eaten not one, but two, complete chocolate cakes. And numerous other types of food that are left too close to the edge of the counter. The worst was when she got at a 10 pound block of chocolate from Trader Joe's - I'd say she consumed around a pound. Luckily for her it made her sick before it got into her system enough to do worse damage. Ughhh. I have to do a quick visual sweep of the counters every time I leave the house. Oh, I'm almost positive these are on WW's Core plan. ;) Which should be good news for your dog. I'm glad you likes them! We did too! SO NOSTALGIC! I loved them. Great post! Uh oh! Glad you at least got to enjoy a few!